In the world of “to-go”, there are constant changes being made to food packaging, restaurant design, and overall operations in order to achieve a consumer-focused experience. Some changes aren’t always so complex, but convenient- and that’s a characteristic that Genpak lives by. Here are 3 modifications to our food packaging that greatly shapes the modern day consumer lifestyle, helping save time and money. 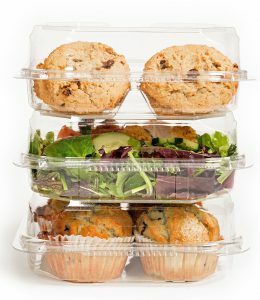 Compartmented containers are always convenient for side portioned food items, which require separating. Years ago, we at Genpak launched our first close-off container with the 203CO, and have since translated that feature over to our microwave-safe and APET products. Our close-off solution has addressed food migration concerns by adding compartments in the base of a container and the lid. We are capable of promoting zero food migration with durable packaging that reigns superior against our competitors. There is nothing worse than carrying multiple containers, only to have them collapse after taking a few steps or when placing them in the car. 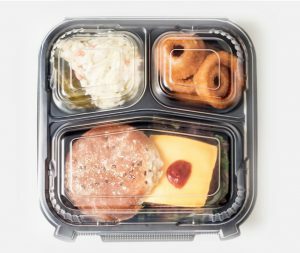 With the emergence of optional take-out family meals that can be enjoyed at home, work, or school, Genpak’s stackable feature helps consumer meals go the extra mile. We have engineered our stackable containers in such way that will secure multiple containers in place, for portability and carrying with ease. Perhaps everyone loves food right off the grill, and it’s even better when enjoyed anywhere, everywhere, and at any time. We’ve caught the drift with our vented-lid and anti-fog feature, which is found in our new black and clear ProView container, which reduces condensation for a clear view. Everyone wants to see their food, especially when it’s fresh off the grill. So, this feature makes it even more convenient for both the operator and the consumer by providing food authenticity and order accuracy. Genpak products are still in the mix as you can spot our sustainable packaging across several establishments. Our products offer market flexibility as a powerhouse to consumer needs. Genpak meets this demand with reputable innovations like ProView, Smart Set Pro, Clear Hinged Foodservice Containers, and Oven Ready Food & Bakery Trays to propel foodservice industry growth. Stay locked in for the next line up of features that define convenience for today’s consumer lifestyle.